There has been SO much negative happening within the sport this winter and spring. It’s been akin to the rain here in California. In track we typically wish for more to be written – just as we here in Cali have wanted more rain. Yet here in California we were deluged with rain this spring to the point of near floods in some areas. Similarly in track, the news about drugs, suspensions, conspiracies, and leadership being involved negatively at the highest levels have given me pause to contemplate. So I’ve resisted the urge to speak my mind, as week after week negative news has abounded. Instead focusing on coaching, as working with youth continues to reinforce my belief in the sport when the greed of professionalism is set aside! Not that I’ve been surprised. Many things I’ve said in the past, and been castigated for, have proven correct. Because one of the real problems in this sport, is the collective turning of heads the other way – as the sport allows itself to be dragged down. Which is why I will say that we need to clean house at the top, because too many have clearly been complicit – money, and it’s pursuit does that. The focus from leadership has been ensuring that we have "stars"; and that records are being set; and not enough on what truly makes this sport great – COMPETITION! On that note, we’re at what I consider to be the half way point in the season. The preliminaries have been completed – the early season relay meets; the high school season; collegiate meets up to that thing called Regionals; and the first few international competitions. Leading us into the major championships – NCAA, USATF, and global National Championships. So, as we head into the good stuff, what do I think about what has already happened? Following are my thoughts heading into this week’s NCAA Championships. World Relays and Penn Relays. I put them together because both are "attempts" at the US pulling together teams to compete against the rest of the world – and we do a horrible job of it! While countries like Canada, China, Britain and Japan, major players internationally, show up with their best. We consistently show up with teams of "whatever we can pull together". We really need to look at some type of system that brings our best together if only for a weekend here or there to begin preparing for Olympic and World competition. It’s possible. USATF needs to make it a priority. I’ve personally looked at how it can accomplished. It wouldn’t be that difficult. What HAS been exciting to watch however, is the new blood rising in the sport. Especially on the sprint side here in the US. Our core has aged and we’ve needed new blood to step up. Thankfully this seems to be the year. On the men’s side Christian Coleman, Ronnie Baker, Noah Lyles, and Fred Kerley seemed best positioned to have a global impact this year. On the women’s side, there’s Dejah Stevens, Arianna Washington, and Shakima Wembley look like this could be their year to have an impact. But the real excitement has been among the international women -both foreign and domestic. Early on Elaine Thompson looked unbeatable, handling all comers and turning in 10.78/22.09 efforts. Then at Pre, Tori Bowie threw down a 21.77 that turned back Thompson (SB, 21.98), Dafne Schippers, and Allyson Felix among others. Then turned around and set a WB in the 150. Second in that Pre race was Shaunae Miller Uibo (21.91) who’d already run 49.77 in her speciality, and has since blazed a 21.76 straight in Boston the same day Bowie set her 150 mark. London is going to be HOT on the women’s side. And once again the race of the meet could be the 200 with Miller Uibo attempting a long sprint double and coming head to head with Bowie, Thompson, and Schippers! Meanwhile the top men have been trying to find their way. Bolt hasn’t competed aside from a coed relay in the Bahamas. And Gatlin & DeGrasse haven’t been close to "championship" form, losing to lesser sprinters. Instead it’s been South Africans dominating the early sprint headlines, with Akani Simbine (9.92) being the dominant short sprinter on the year to date. And three of the top five sprinters on the clock currently are Africans. We haven’t seen African representation like that since the early nineties! That said, the two best performances on the men’s side have been in the field. 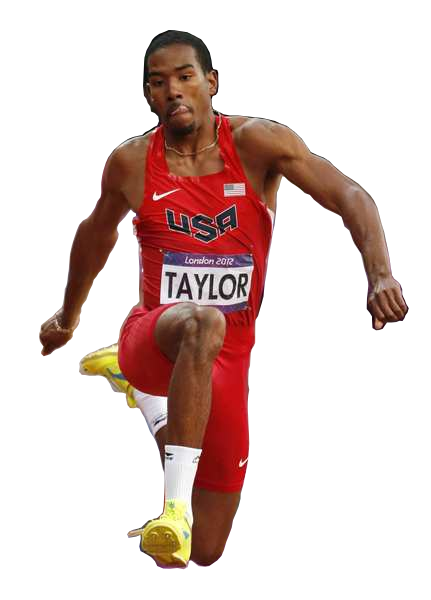 First what I consider to be the best mark of the beginning of the season – Christian Taylor’s 59’ 5” to win at Pre. Personally, I thought Taylor was AOY last year, based on consistency ALL year, to go with outstanding marks.Already#2 all time in the triple jump he threw down the 3rd farthest triple jump of all time at Pre. Moving to #2 all time in the javelin was Thomas Roheler with his 308’ .75” toss – the #6 best mark of all time. Back to sprinting, the man who would replace the soon to retire Usain Bolt, is 400 WR holder Wayde van Niekerk who has spent time in the short sprints early on this season, running 10.04/19.90 and 19.84 on a straight. Foreshadowing what could be another very fast excursion over 400 meters later in the season. Van Niekerk is positioning himself to be the next great thing! Before that, however, we’ll have the NCAA Championships with Fred Kerley looking for the win and perhaps something faster than the 43.70 he’s already thrown down. I’m expecting lots of excitement this week. Florida is attempting to repeat as men’s champion, and has a very good chance with super freshman Grant Holloway; a pair of outstanding 400 hurdlers; next in line jumper De Andre Bates; and solid relay teams to go with several other complimentary athletes. Similarly I like Oregon’s women and their stable of sprinters. Though the LSU women could have a lot to say about that. The collegiate athletes will be ready to throw down. Leading off what should be an exciting month of championship meets before the excitement of the European circuit sets in! Yes, we’re now entering the meat and potatoes part of the year. Time to settle in as the world’s best begin their drive towards the World Championships later this summer in London. Time for must see TV! This entry was posted on Monday, June 5th, 2017 at 3:38 pm, by CHill. You can follow any responses to this entry through the RSS 2.0 feed. You can leave a response, or trackback from your own site.